A brochure, together with a booking form, is available to download and print. PLEASE CLICK here. Our 2016 European excursion will be ‘Holland, the Rijksmuseum & the Dutch Masters‘, a six-day tour departing 22nd September 2016. We will sail the overnight crossings on board a P&O Ferries return cruise ferry from Hull to Rotterdam. On board facilities include a restaurant, bar and evening entertainment. Dinner is included on board the ferry on the outbound crossing. No other meals are included on board the outbound or inbound ferry. We will stay three nights at the centrally located 4* Hampshire Hotel in Delft, located a five minute walk from central Delft. Set three course dinners, without drinks are, included in our hotel on the first and second evenings, and the third night is on bed and breakfast basis. A non-refundable deposit of £75.00 per person is required upon booking. The balance must be paid by 28 July 2016. A single room/cabin supplement costs £159.00 per person. Further information on cabin options, etc is available in the brochure. Please note that we have been upgraded and all cabins are for two people. Full details of the tour can be seen online. At the bottom of pages 1 and 2 of the printed brochure, you are invited to click on the View Your Tour tab and quote fyld161. You can download and print the brochure here. Day 1: We board our executive coach at our designated pick up points and en route to Hull we enjoy a guided tour at the Yorkshire Sculpture Park near Wakefield, featuring a changing display of large bronze sculptures by Henry Moore. On arrival in Hull we board our P&O Ferries overnight crossing to Rotterdam. We have reserved inside cabins. Dinner is included this evening, and the rest of the evening is at leisure to explore the ship. Day 2: We arrive early this morning at Rotterdam. We then transfer to The Hague and on arrival we enjoy a guided tour at the Mauritshuis, known as the ‘Royal Gallery of Paintings’. Recently reopened after a major expansion and renovation the gallery is home to an outstanding collection with masterpieces by Rembrandt, Van Steen, Frans Hals, Ruysdael, Rubens, Van Dyck, and Vermeer, including his famous ‘Girl with a Pearl Earring’. This afternoon we visit the Panorama Mesdag, a cylindrical painting over 14 metres high and 120 metres in circumference. Depicting the vista of the sea, the dunes and Scheveningen village, this is the largest painting in the Netherlands and was painted by Hendrik Willem Mesdag, the most famous painter at The Hague School. On arrival in Delft we check in at the centrally located 4* Hamsphire Hotel for a three night stay. Set 3 course dinners without drinks are included in our hotel on the first and second evenings, and the third night is on bed and breakfast basis. Day 3: We visit the recently refurbished Rijksmuseum in Amsterdam this morning for a guided tour of this world renowned art collection, the most famous of which is Rembrandt’s ‘The Night Watch’, but which also includes many Dutch Old Masters such as Jan Steen, Frans Hals and Vermeer. As well as paintings, the collection includes sculptures, clocks, Delft Blue, porcelain and Asian and Oriental art. We then spend some time at leisure in Amsterdam and you may choose to visit the Van Gogh Museum on an individual basis. 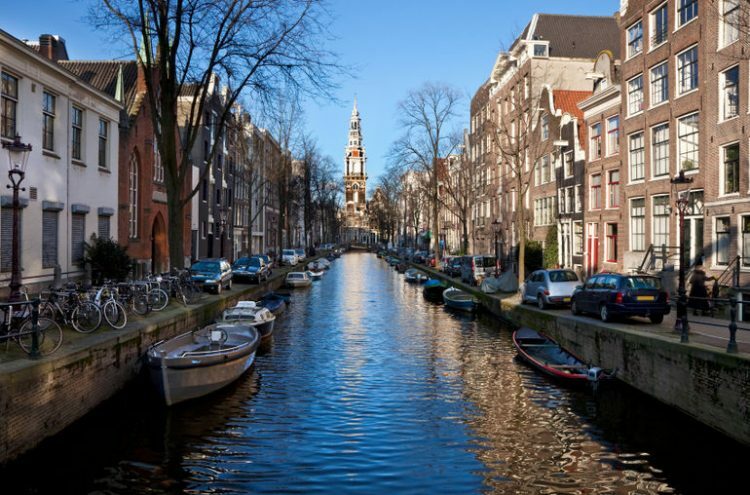 Later this afternoon there is an optional relaxing short cruise to admire some of the city’s stunning architecture from the picturesque canals. Day 4: The Royal Palace of Het Loo was built in 1685 as a country residence for William III and his wife, Mary Stuart, and was used as recently as 1962 by Wilhelmina as her royal residence. After free time for lunch in the beautiful Palace gardens, we drive the short distance to the Kröller-Müller Museum. Our guided tour of the remarkable private collection of late 19th century and early 20th century paintings introduces us to some of the 278 works by Van Gogh, an outstanding collection of Chinese porcelain and many hundreds of Delftware items. Day 5: This morning we visit the Koninklijke Porcleyne Fles in Delft. The Koninklijke Porceleyne Fles / Royal Delft is the only remaining factory of the 32 earthenware factories that were established in Delft in the 17th century. We enjoy coffee or tea with Dutch apple tart before we start on a guided tour through the history of Blue Delft and Royal Delft and its development and production process. We see a master painter at work, visit the dining room of Vermeer and the Dutch Royal family Chamber, the museum with antique Delft pieces, the historical courtyard and visit the factory. The showroom has a comprehensive collection of handpainted Delft Blue by Royal Delft, as well as an extensive selection of Dutch earthenware and souvenirs. We finish our tour with an included Dutch lunch. The afternoon is at leisure in Delft and on an individual basis you may choose to visit the Vermeer Center. The Vermeer Center in Delft offers a visual voyage of discovery through the life, work and city of Johannes Vermeer. Step into 17th century Delft, see samples from Vermeer’s oeuvre, go in search of his mentors and find the stories behind the paintings. We return to Rotterdam for our P&O Ferries overnight return crossing back to Hull. Day 6: We arrive at Hull early this morning and transfer by coach back to our original pick up points. For further information please contact our tour organiser Nigel Bramley-Haworth; Tel: 01254 888423; email: Bramleyhaworth@aol.com; 25 Ash Lane, Great Harwood, Blackburn BB6 7NU.